Luna has and always will be intertwined with New York City. Regardless of the band members geographic origin or current residence, Luna embodies a uniquely New York sensibility. Still reeling from a sublime Philadelphia show on Monday night we made the short 97 mile journey from our home in Philadelphia to see them for 2 of the 3 shows as part of their residency return to NYC this week. 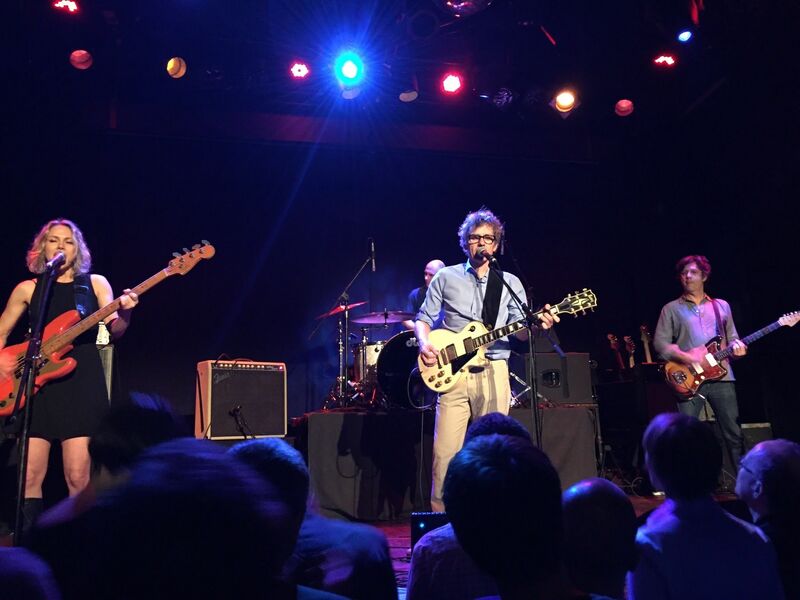 Entering the Bowery Ballroom on Thursday, a venue we've seen Luna on previous occasions, brought back many happy (and a few sad) memories from the late 90's and on. Inside we encountered a few other Philadelphians, who like us couldn't miss another Luna show. We briefly chatted with Drake, the guitarist from the "Good Dogs" band that backs Diane Coffee (aka Shaun Fleming), remarking how much fun their set was in Philly, and how many new fans they'd made. Opener Diane Coffee took to the stage around 9 with their infectious and original mash up of psychedelic glam rock and grooving Motown soul revue. Shades of T-Rex, NY Dolls, Bowie, Meatloaf, and even Queen were evidence as Shaun and his band made even more new fans, perhaps in spite of the obvious differences between the drama of their music and that of Luna. Luna took the stage around 10pm seeming to be the band that time forgot. Looking (and performing) as if they had not aged at all during their 10 year hiatus, they fittingly begun with Slide to the cheers of the savvy and appreciative NYC crowd. The took us through beloved tour staples of most of their catalogue such as Chinatown, Tracy I Love You, Speedbumps and Bewitched, adding a stunningly gorgeous version of Kalamazoo. Only albums "Romantica" and "The Days of Our Nights" were not represented in the setlist. Luna spent the better part of the 90's and 2000's making near perfect records in pro studios with real budgets, but to many their live shows have always been revered as the apex of the Luna experience. And now, the band is truly better than ever. Whatever their time apart has afforded they are re-energized with even more powerful musical instincts and prowess. The interplay between Dean's vocals, Sean and Dean's guitars (oft compared to Television), between Britta's dancing and swaying bass and vocals, and Lee's tighter than tight drumming was all front and center, as was the way it all comes together and builds to crescendo after crescendo. Simple evocative songs grew and bloomed, framed by Dean's subtle and poetic lyrics, often sung along in unison by the crowd. Luna was clearly having a great time playing together, basking in the glow of the appreciative audience, Dean bantering about the NY Mets among other things, and imploring new followers for the nascent Lee Wall managed twitter account @SeanEdenQuotes. They closed their set with an epic and highly anticipated 23 Minutes in Brussels and followed with encores of Season of the Witch, Indian Summer, and a gorgeous show ending Moon Palace. We spilled out into the Bowery thrilled with what we had just been a part of. 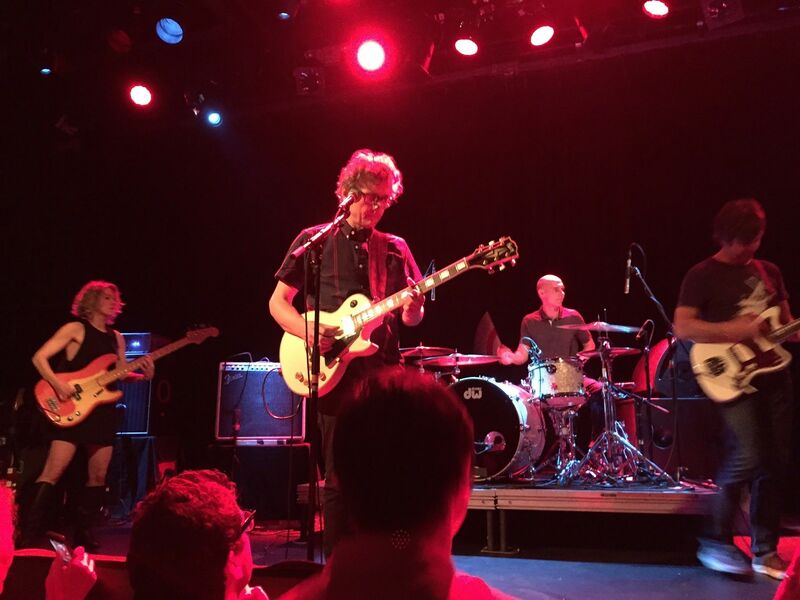 A torrential downpour on Saturday night, only slightly slowed our eager travel to Brooklyn, where Luna played their final (for now) NYC date at the Music Hall of Williamsburg. At a capacity of 525, only slightly smaller than the Bowery, this intimate space bristled with energy and enthusiasm for their NY finale. Faces familiar from the prior show included Daisy, dressed in a sparkling evening gown to celebrate the monument of the occasion. We chatted with other devoted fans, making the trip from all over NY and beyond. Our 18 year old son, now a college freshman made the trip with a friend from New Haven CT (sorry Dean) to see his first ever Luna show, having grown up hearing this music on constant repeat but being the wrong age to have experienced it live. This was not a unique theme, we met a father who flew in from Colorado to see the show with his 18 year old daughter attending art school in NY - her first Luna show as well. Good parenting indeed. The Williamsburg show was without a doubt the best sounding of the shows we saw, offering a lush 3 dimensional mix of the band its full glory. The night was also marked by more than a few surprises. The main set included Cindy Tastes of Barbecue and ended with fan favorite Time to Quit. Despite a previously hoarse voice, Sean sang Still at Home (at the same time dashing my hopes to hear Broken Chair) and was met with roaring cheers and applause. 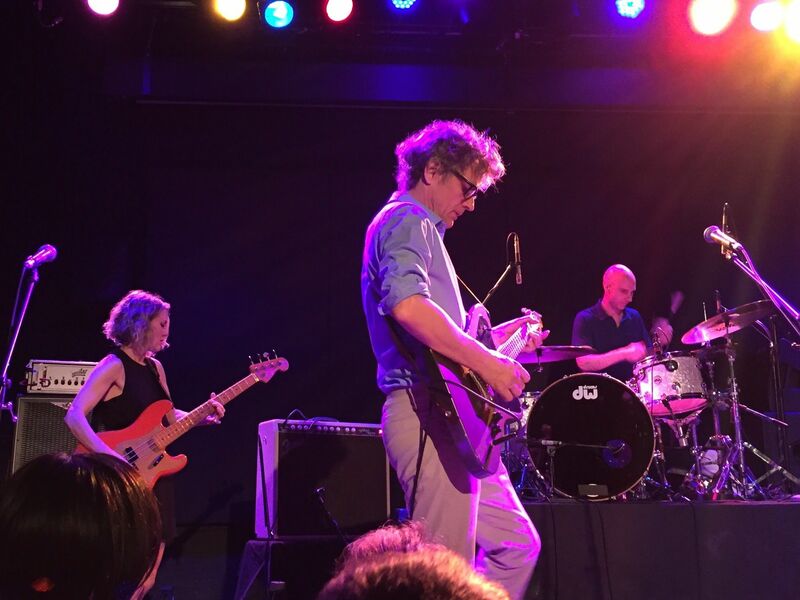 Then original Luna (and also reunited Feelies) drummer Stan Demeski joined the band for an explosive 23 Minutes in Brussels, Chinatown, and Friendly Advice. 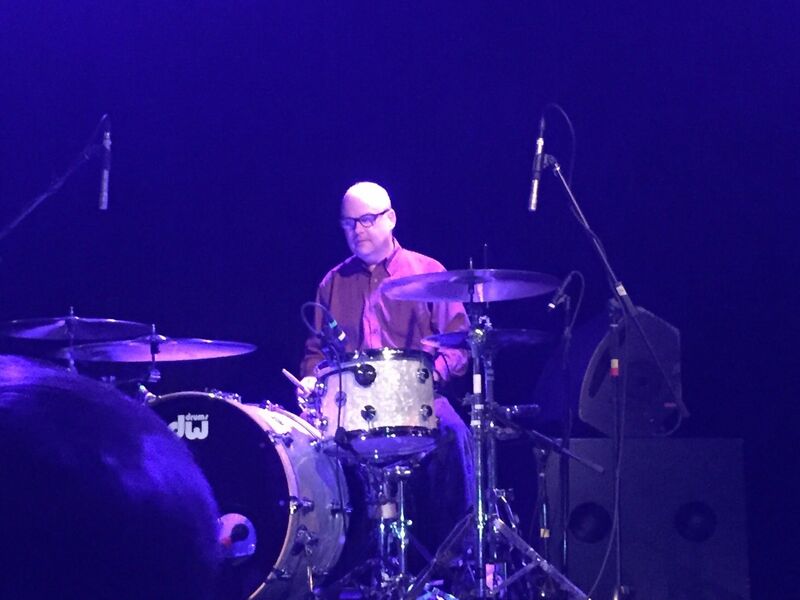 Stan is an incredible drummer and last played onstage with Luna circa 1996. Dean mentioned that they hadn't had even had time to rehearse with Stan, which was truly unbelievable given how perfectly locked in step he was with them, and the audience erupted with appreciation for this reunion of reunions. Cheerful, chipper, funny banter punctuated the night, again turning to the baseball playoffs, and responses to titles that were repeatedly called out over the night. After someone repeatedly called for Superfreaky Memories, Sean joked that "you have already made your point sir". Dean joked that they would need a cello to play it and several in the audience volunteered for the task. Dean and Sean joked about never dating anyone named Tracy after playing said song, and a woman in the audience then proceeded to argue that this was not the case and that he even "wrote a song about her". The only technical glitches of the night involved serial fuzz pedal misbehavior, affecting both Dean & Britta's rigs, and prompting them to move into a wonderful naturally overdriven version of Time to Quit as well as an only slightly less bass fuzzy, show ending version of Fuzzy Wuzzy. (And while we're on the subject of guitar geekery, Dean primarily played an 80's white Japanese Burny Les Paul Custom copy, picking up a Cadillac green Fano Firebird inspired guitar for several capo/open tuned songs, Sean played a white '65 Jazzmaster reissue as well as a '63-64 worn sunburst Jazzmaster for his gorgeous tremolo explorations, and Britta sailed through the night on her tried and tested fiesta red P-bass with gold anodized guard. Sorry I couldn't help myself). In the end these shows were a perfect compilation of everything that we love about Luna, reminding us how incredible a band they were and are. It's hard to imagine wanting to see another band 3 times in one week, but if I could I would be heading to Portsmouth or Canada or California right now. Let's hope that this is not the last we get to see and hear of this remarkable, irreplaceable, and truly essential band. AHFOW: Sorry for using Janice's picture again but it so lovely! Thanks again to Frank for this review - if you want to write a review of a show for A Head Full of Wishes please get in touch.